Waverly Hills Sanatorium stands tall and intimidating on top of one of the highest hills overlooking Jefferson County, Kentucky. It is a massive building — 180,000 square feet — and foreboding in it’s darkness and mystery. Think of all of the ghostly adjectives you can and Waverly is all of them — creepy, eerie, spooky, bone-chilling, hair-raising … we could go on, but you get the point. When Cameron and I decided to embark on this road trip, we did so fully prepared to be spooked. A tuberculosis hospital where thousands died — some estimates say as many as 64,000 died there before the antibiotic streptomycin was discovered in 1943 — and that has been deemed one of the “scariest places on earth” couldn’t possibly be anything other than frightening. And while the tour proved to be scary in its own right, it was also an extremely informative, interesting and fun experience. I’m going to pause here to interject this public service announcement: If you get spooked easily, hate horror films and scary movies, or don’t believe in ghosts … this experience MIGHT not be for you. I say ‘might’ because Cameron is guilty of all of the above … and she had a blast. She nearly clawed the skin off of my right arm, but she had a blast. A lot of people died in Waverly Hills — that isn’t speculation or folk lore or a ghost story. It is fact. Many tens of thousands of people suffering from tuberculosis in the 1920s and 30s died there. And whether or not you believe in the paranormal, it’s hard to think that anywhere in the world has ghosts if this place doesn’t. So if this freaks you out, skip this road trip. But if you can go into this experience with an open mind, open eyes and open ears, and listen to what your guide has to tell you, listen to the history and then to the ghost stories, I guarantee that you’ll be just the right amount of scared, and more intrigued than you may have expected. Patients were wheeled out of their rooms into an open-air solarium to receive their daily heliotreatment. Photo courtesy of Waverly Hills Sanatorium. What the solarium outside of patients’ rooms looks like today. After a mere 2 hours in Waverly Hills, I could talk about it for days — the history of the hospital built on a hill, the patients that went through its doors, the ghosts that still wander the halls — and this post could get really long. So in an effort to keep things (kind of) short, I’m going to list the top 5 things you should know about Waverly Hills Sanatorium. Everything else … well, you’ll just have to take the tour for yourself. 1. A little bit of history. A wooden, two-story hospital was originally constructed in 1910, but with tuberculousis rampant in the area, the building wasn’t big enough to house all of the patients. So a new building was constructed in 1924 with five floors designed to house 500 patients — though in the height of the epidemic it is believed there were more than 1,000 occupied beds at Waverly Hills — and the new sanatorium opened in 1926. Waverly was its own community — it had its own post office, dentist and barber shop — and because they weren’t sure how TB was contracted, once you came to Waverly as a patient or as staff, you weren’t permitted to leave until a cure was found. 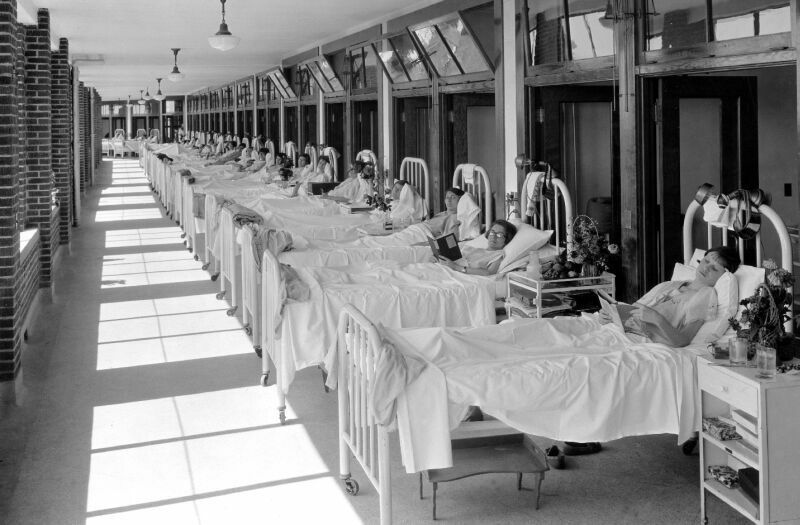 By the 1950s, tuberculosis was nearly eradicated thanks to the antibiotic and the hospital was closed in 1961. It reopened a year later as the Woodhaven Geriatrics Sanitarium but was closed by the state in 1980 after rumors of patient abuse. It was purchased in 2001 by Charlie and Tina Mattingly who have opened it up for tours. You can learn more about the history here. 2. The body chute wasn’t originally intended to be for bodies at all. When the building was constructed, architects didn’t plan for how to heat such a massive space. Doctors didn’t want furnaces or boilers on top of the hill because they interfered with the patients’ heliotherapy which was basically fresh air and sunlight. So this tunnel was built to move heat and later supplies from the bottom of the hill up to Waverly. But when the TB epidemic reached its height and death counts were high, the tunnel was used to move bodies out of the sanatorium so that the surviving patients wouldn’t see hearses pulling up on the hill and wouldn’t know how many people were dying. 3. Room 502 was actually a washroom. This room is one of the most famous at Waverly Hills because it is rumored to be one of the most haunted areas. It was a washroom where nurses could shower and dress between shifts. A young nurse committed suicide outside of this room after she realized she was pregnant — and unmarried — and had contracted tuberculosis. Years later, it is said another nurse killed herself by jumping from the room’s window. Our guide told us that it is common for women to become very nauseous or dizzy when they go inside this room, especially if they are pregnant. 4. If you’re looking for ghosts, visit the 4th floor. Despite the sickness and death, we’re told Waverly Hills was a hopeful place. The sick spent lots of time together, kids played games on a rooftop swing set. They made the best out of a difficult time. Because of this atmosphere, many of the ghost stories you hear from Waverly are fun and light-hearted ones: kids playing with rubber balls and plastic trucks that people leave for them, a man playing catch with his dog in the hallway. But on the 4th floor, scarier things have happened. People getting locked into rooms even though there are no locks on the doors. An ice cold feeling of dread filling your body for no reason. Shadow people, lights coming from rooms with no electricity, door slamming shut when no one is around them. Even our tour guide said he didn’t much like the 4th floor. So if you’re looking for ghosts on your trip, try starting there. 5. There was little reason for autopsies at Waverly. The morgue had only 3 body coolers because very few bodies were kept for any length of time. Very little was known about TB and because it was labeled “The White Plague,” many people immediately thought of the Black Plague and were afraid to touch the bodies of those who’d died of the disease. In actuality, a person can’t contract TB from a dead body, but none of this was known at the time. The bodies moved through the morgue and out of the body chute quickly where they were claimed by family members or — because many were superstitious about the disease and thought the spirit of the illness would “jump” to them if they were around their deceased loved ones — many bodies were placed in a mass grave on the property. Waverly did perform some autopsies because at the time a hospital was required by law to conduct an autopsy on 17% of the dead. 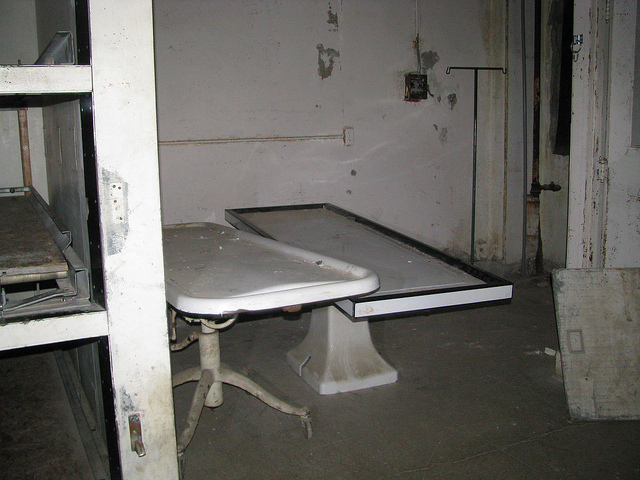 An autopsy table, the body coolers and several beds still hold residence in Waverly’s morgue. Normally I’d offer you the address (4400 Paralee Lane, Louisville, KY 40272) and wish you well. But we found the directions to Waverly’s front doors are nearly impossible to follow whether by Google Maps, your trusty GPS, or vague landmarks from a local gas station attendant. What they should tell you is: “Turn right at the golf course, go left at the fork and then follow the narrow, dark, winding road up, up, up until you break over the top of the hill.” Because from there, you can’t miss the old tuberculosis hospital towering over top of you. Here’s our best advice: get directions to Bobby Nichols Golf Course (4301 East Pages Lane, Louisville, KY 40272). When you turn into the golf course, follow the road around a couple of greens and when it forks, go left. Follow that road (it’s sort of scary, see our description above) through the iron gates and you can’t miss Waverly Hills in front of you. The 2-hour guided tour that we took is $22 and worth every penny. We walked through all five floors of the hospital with an extremely knowledgeable guide and got a lot of history of the building, its former patients, and its ghosts. We actually spent about 90 minutes inside of the hospital and body chute; the first half hour was devoted to a video about the sanatorium and a few clips from ghost hunting shows it has been featured on. The cost of tours goes up from there. The 4-hour (half-night) paranormal investigation is $50 and goes from midnight to 4 a.m. The 8-hour (full-night) tour and paranormal investigation is $100 and goes until 8 a.m. No one under 18 is allowed on these investigations. These tours are available March through August on Friday and Saturday evenings. Reservations are required. Waverly Hills also offers a few day time historical tours and private all-night tours. For more information about all tours available, visit the Waverly Hills website. Three body coolers inside the morgue. Waverly Hills only ever had 3 because few autopsies needed to be performed – they knew how people were dying. They only maintained a 17% autopsy rate that was mandated to stay open. Paranormal investigators place children’s toys around Waverly Hills to try to get young ghosts to play with them or move the objects. The body chute. 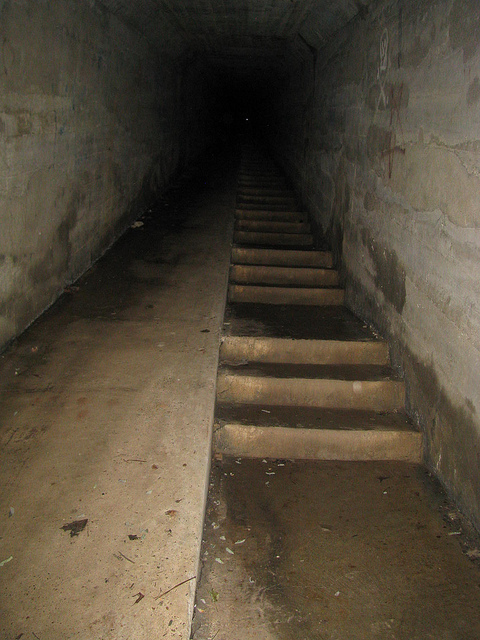 This tunnel was originally built to move supplies from the bottom of the hill to Waverly Hills, but when the TB epidemic reached its height and death counts were high, it was used to move bodies out of the sanatorium without the surviving patients seeing how many people were dying.